If you are an early riser, look out a south-facing window on the morning of March 7 (Sunday) to see a lovely last quarter moon in front of the constellation Scorpius the Scorpion. 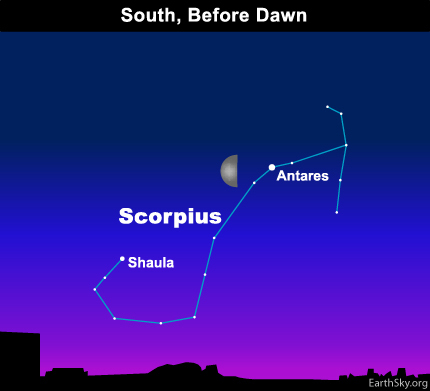 The reddish star near the moon is Antares, considered the Scorpion’s ruby Heart. Antares is a red supergiant star, located roughly opposite in the sky to another famous red supergiant star, Betelgeuse in the constellation Orion the Hunter. Both Antares and Betelgeuse can clearly be seen as reddish stars, but not in the same sky. As a rule of thumb, when you see Antares in the sky, you won’t see Betelgeuse, because it will be below the horizon. Why? Simply because these two stars are located on opposite sides of Earth, and thus they never appear in our sky at the same time. Both stars are interesting because they are near the end of their lifetimes and these massive supergiant red stars are expected to explode as a supernova. The supernova could happen tomorrow, or millions of years in the future. Astronomers don’t really know for sure. 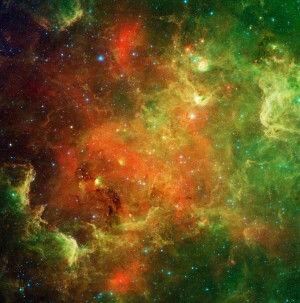 These stars are far enough from us (hundreds of light-years) that the deadly radiation probably will not harm Earth.